The ABCs of Craftulate … and this week’s Kids Co-Op Linky! It’s always fun for me to read over the answers of ABCs I receive. I love finding new things about bloggers I know, getting to know bloggers I didn’t know, and realizing connections I have with them. That’s my favorite part. Like today’s feature … I love that George from Craftulate and I both like to start the day off with a Diet Coke, are 5’1″, and love penguins! I also LOVE her favorite quote. Me and some of my friends “IRL” are know to say that quite often! So, make sure to read over George’s ABCs and check out her blog filled with fun crafts for kids that don’t make too much of a mess! favorite Diversion Reading kid craft blogs! Favorite Game Lego Harry Potter on PC or XBox! a weird thing in your Purse/bag A pacifier case with no pacifier! Unusual Fact I have only worn black, white and denim clothes for the last 4 years! What makes you late My son refusing to put socks on! 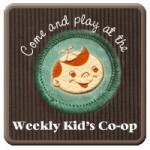 And now for this week’s Kids Co-Op linky!